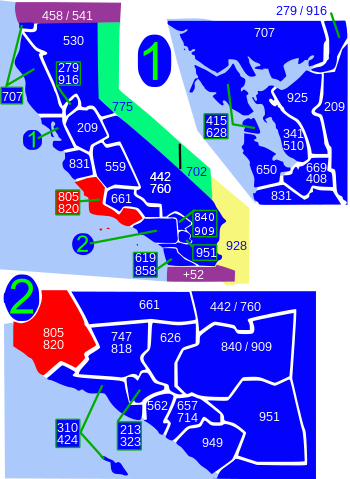 Map of California numbering plan areas (blue) and border states. Area code 805 is shown in red. Area codes 805 and 820 are California telephone area codes that were originally split from area code 213 in 1957. They include most or all of the California counties of San Luis Obispo, Santa Barbara, Ventura, plus southernmost portions of Monterey County. On February 13, 1999, the area code was split, with area code 661 having been created for the inland areas, which are San Joaquin Valley, Santa Clarita Valley, and Antelope Valley. Area code 805 also serves the US military facilities in Kwajalein, Republic of the Marshall Islands with a Paso Robles prefix (805-355-xxxx). This arrangement originated from the US Army's first satellite communications station having been built at nearby Camp Roberts. In August 2016, the California Public Utilities Commission held a series of hearings regarding the potential need to provide a relief area code for 805 in the form of an overlay or a split. On May 25, 2017, the Commission approved 820 as an overlay area code. New telephone numbers with the 820 area code began service in June 2018. ^ "805 Area Code". California PUC. Retrieved 2017-04-02. ^ "DECISION GRANTING REQUEST FOR AN ALL-SERVICE AREA CODE OVERLAY IN THE 805 NUMBERING PLAN AREA". cpuc.ca.gov. May 25, 2017. Retrieved 2017-05-25. ^ Kisken, Tom (May 28, 2018). "New area code changes the way people dial in the 805 as of Saturday". Ventura County Star. Retrieved 29 May 2018. This page was last edited on 11 January 2019, at 07:00 (UTC).